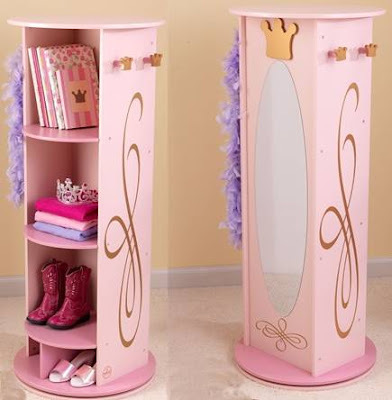 The little princess in your life is sure to love our KidKraft Princess Dress Up Unit! Large enough for multiple kids to play at once, the Kidkraft Princess Dress Up Unit swivels 360° and features five convenient storage compartments, four crown-shaped knobs for hanging dress-up clothes, purses, coats and hats. The tall, shatterproof mirror is perfect for girls to model their dressup costumes. Finished in cheerful pink, the Kidkraft Princess Dress Up Unit will make a great addition to any little girl's room. Rubberwood, also known as parawood, is harvested from the rubber tree, which is also used for producing commercial latex. Rich in appearance, durable, and easy to maintain, rubberwood is becoming a highly popular choice for the manufacture of home furnishings. Rubberwood has been used for centuries for its sap, from which latex rubber is made. Although there are now a number of synthetic rubber materials, natural latex is still a popular option, and the trees are farmed in huge quantities in hot, tropical climates. While wood from rubber trees has always been used on a small scale for making furniture and other home goods, it was little known outside of the countries where the wood grows naturally until the early 1900s. Because rubber trees only produce marketable latex until they are about thirty years old, farmers typically burned the trees in order to make room for new plantings. However, plantation owners eventually recognized the commercial value of the wood and began to harvest the trees for lumber once they no longer produced useable latex. Rubberwood furniture, flooring, wooden toys, cutting boards, and a variety of other products make up a significant percentage of exports from Southeast Asian countries such as Malaysia, where much of the wood is grown. Dense, rich grain which can be stained or painted easily. Because rubber trees are plentiful and easily harvested, rubberwood furniture is typically more affordable than other tropical hardwoods, such as teak. It is also lightweight and sturdy, making it a safe choice for children's furniture and wooden toys. As it can be easily cleaned, it is ideal for use in high chairs and other children’s products. There are hundreds of rubberwood products available for baby nurseries, playrooms, and kids’ bedrooms, in styles and colors to complement any décor. 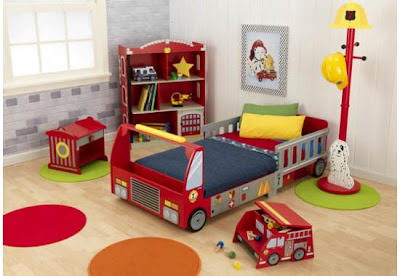 Rubberwood furniture manufacturers such as Kidkraft, which can be purchased below list price from www.akidplace.com, include bookshelves, children’s tables and chairs, bedroom furniture, toy boxes, desks, and much more. If you're like the vast majority of parents of little kids, you probably have come to be accustomed to lack of sleep at night. Once you have survived the infant period with victory, you would think that the early childhood years would present moms and dads with a great deal more of rest. However, once children learn the art of manipulating in order to get their way, they come up with tactics for evading going to bed. Little ones need to have adequate rest just as much as their parents; it's essential to their health and well-being and it also makes them more pleasant to be with. When little kids are tired they become irritable and difficult to reason with. What are parents to do when their sweet angel transforms into an absolute ogre once evening comes about? One of the most important steps that parents can take in their mission to get their children to sleep at night is establishing a daily bedtime routine. First and foremost, it is absolutely crucial that you remain consistent. No matter what routine you start for your precious angel at bedtime, ensure that the ritual is the same every single night. Kids thrive on routine, and having the same routine each night will help get them in the mood to go to sleep. Bath-time should be a regular part of your son's or daughter's routine before going to bed each night. Warm baths are soothing and help to not only make them feel nice and clean, but relaxed and serene and ready to go to sleep. The majority of parents read a story to their children at bedtime, and for good reason, it's a great time for fostering special bonding between children and moms and dads, little ones learn and they settle down. More and more children now have TV’s in their rooms which is very detrimental to their health and well-being. A bedroom should be a place for rest. Not to mention that research shows a connection between obesity and lower test grades in kids who have television sets in their bedrooms and the fact that you will not know what they are watching. Instead of a television, opt for having soft, soothing music play in your child's bedroom if needed. 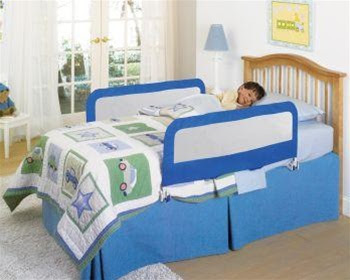 Safety bedrails should be installed to help prevent your child from falling out of bed. They're really easy to install these days and some fold down to make climbing in and out of bed easier. Reassure your children that you will check on them throughout the night. If your child does get out of her bed after being asleep, put her back into her bed without saying anything to her, this way she knows that you mean business. Keep repeating this and eventually she will stay put in her own bed. Toddlers aged 1-3 years old require 12-14 hours of sleep in a 24-hour period. Preschool children ages 3-5 years old require 11-13 hours and school-aged children ages 5-12 require 10-11 hours of sleep per night. Set up a chart to keep a record of your child's bedtime progress and mark his results with reward stickers. Whatever approaches or tactics you decide on for establishing a bedtime routine for your child, always conclude the routine with your child in his or her own bed. He will fully understand what's expected and will soon be sleeping through the night without difficulty. Bonnie Lim is the founder of A Kid Place. Check out her blog at blog.akidplace.com as well as her online store at www.akidplace.com. Kidkraft's most recently released dollhouse, the Alexandra Dollhouse, is now available at A Kid Place. As all Kidkraft dollhouses are, the Alexandra is made of wood and like most of their dollhouses, it fits fashion dolls that measure up to 12 inches tall, including, Barbie and Bratz. 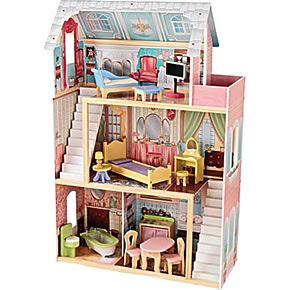 Featuring three floors and four rooms, filled with fourteen pieces of furniture, in lovely shades of pastel, the Kidkraft Alexandra dollhouse is sure to delight girls, both young and old, alike. Kidkraft has lots of great new products coming out in 2011. The latest that we are offering at AKidPlace is the Round Top Storage Chest. Available in either White or Natural, this attractive toy box features wood construction, handles on each side for easy mobility and lid supports to prevent finger-pinching. Perfect for storing children's toys, games, books or even clothing, the Kidkraft Round top Storage Chest will make the perfect addition to any child's bedroom or playroom.